Season Tickets Package. Only productions highlighted in pale yellow are part of the Season Tickets Package. Off-the-Hill. Visiting productions from Playhouse in the Park's touring Off-the-Hill Productions are in light purple. The creative team responsible for a recent Broadway flop (in which three chorus girls were murdered by the mysterious "Stage Door Slasher") assemble for a backer's audition of their new show at the Westchester estate of a wealthy "angel." The house is replete with sliding panels, secret passageways and a German maid who is apparently four different people- all of which figure diabolically in the comic mayhem that follows when the infamous "slasher" makes his reappearance and strikes again. Mix a Hitchcock masterpiece with a juicy spy novel, add a dash of Monty Python and you have the intriguing, thrilling, riotous and unmissable comedy. The show hurtles a notorious fugitive and a spellbound blonde from a London music hall north by northwest to Scotland’s most remote highlands. Will they save Britain from a den of devious spies? This is a fast-paced tale of an ordinary man on an extraordinarily entertaining adventure. 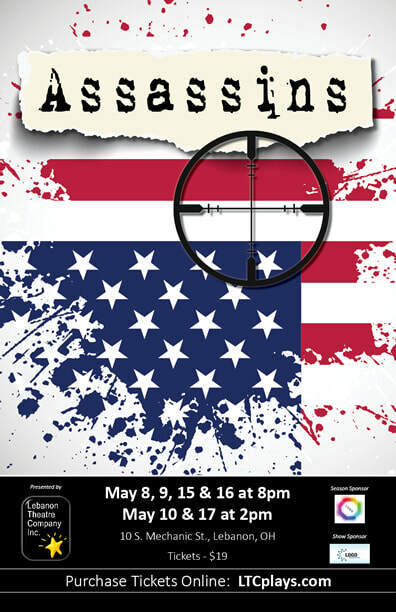 In this darkly humorous musical review, Stephen Sondheim (music and lyrics) and John Weidman (book) depict nine misfit men and women who attempted (four of them successfully) to assassinate American Presidents. While every nation has its assassins and would-be assassins, only in America, the authors suggest, do disturbed and disturbing individuals act not because they hope to influence national politics, but because they are wrapped up in a malignant sense of entitlement. Feeling betrayed by the failed promise of American democracy and the American Dream, they strike out at the symbol for America: the American President. Assassins spans several musical styles and many decades in a dizzying series of musical and theatrical inventions that culminate in the assassination of John F. Kennedy.